Arrays in java are used to hold similar data types values. System.out.print() method does not print values of array. In order to print array values we have different ways. Normally we use for loop and by using index we will print each element inside array. let us see how many ways we can able to print values of array. 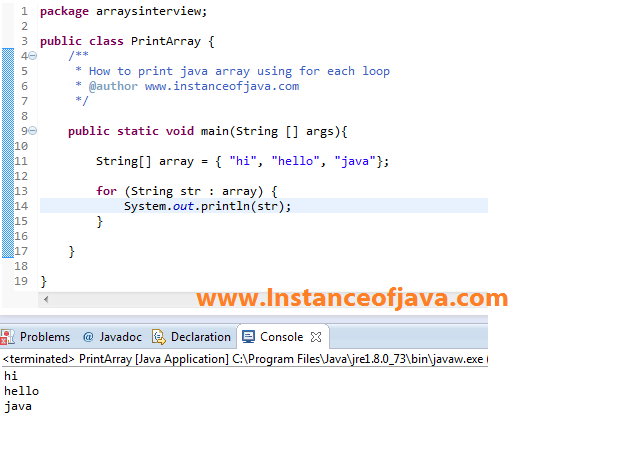 How to print array in java using for loop? Yes we can print arrays elements using for loop. Find the length of the array using array.length and take initial value as 0 and repeat until array.length-1. Then access each index values of an array then print. From java 1.5 using enhanced for loop also we can print array values. By using Arrays.toString(array) method we can print array values. Arrays,deepToString(array) method added in java 5 with generics and varargs.